I wish other shopping malls and big buildings will implement QR codes in car parks like how KLCC do it. Forgetful visitors need not snap with a camera or scribble the lot number or floor, just to remember later where they have parked. We finally see QR codes put to good and practical use. How and what do you do as the driver? The QR codes are on pillars for you to scan with a phone. When you parked your vehicle, look for the nearest pillar with a code displayed. 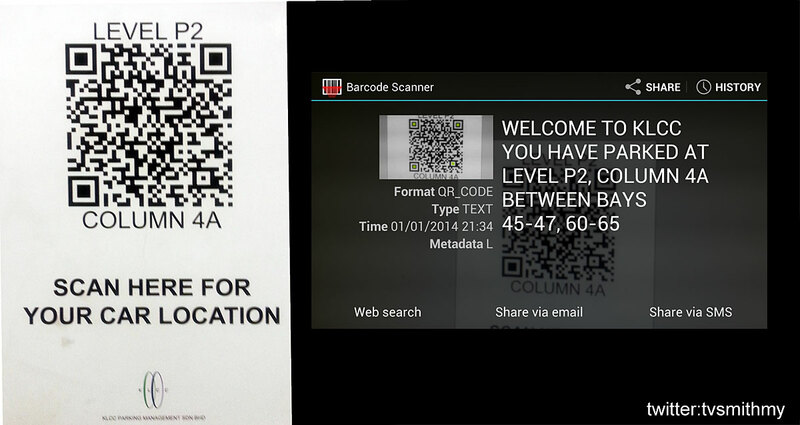 Turn on the code scanning app on your smartphone and scan it. The location can then be stored or shared in several ways. I use the free and efficient Bar Code Scanner App on my Android phone. Here’s a snapshot of a pillar (left) and my Galaxy phone’s readout (right). This entry was posted in Motoring, News & Commentary, Tech and tagged car park, klcc, kuala lumpur, parking, petronas twin towers, qr code, suria klcc by TV Smith. Bookmark the permalink.